At Cuker, we love supporting a good cause that helps the local community, like San Diego based non-profit Boys to Men. This inspiring organization provides an after school mentoring program for at-risk middle school and high school boys. 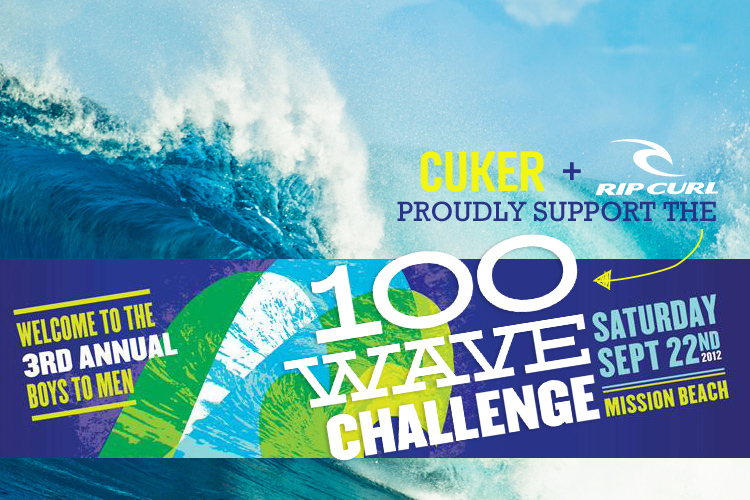 Last September, we were proud to surf at their annual 100 Wave Challenge to help raise money for the cause. This year, we partnered with our friends at Rip Curl to donate board shorts to the organization. Boys to Men will be hosting their 3rd annual 100 Wave Challenge this Saturday, September 22 in Mission Beach. Help support our good friend and neighbor Mike Nelson as he surfs for the cause! Boys to Men’s after school mentoring program is an exciting new community based mentoring program focused on middle school and high school boys identified by school administration to be at risk of academic failure. This group mentoring approach is drawing high praise from school principals, teachers and parents for its ability to make a positive impact on at-risk boys. Published on September 20, 2012 .